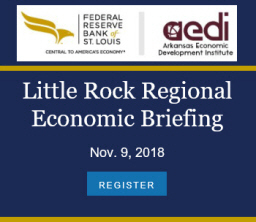 The latest report from the Bureau of Labor Statistics showed the Arkansas unemployment rate ticking up from 3.7% to 3.8%, but both the household survey and payroll survey indicated solid employment growth. The uptick in the unemployment rate was attributable to an increase in the number of unemployed in both January and February, up by 1,500 over the two-month period. Meanwhile, the number of employed has increased by more than 3,200 over the same period. The employment gains and the consequent expansion of the labor force suggest that the higher number of unemployed might be attributable to improving labor market conditions as more potential workers are drawn into the market—or it might just be a data anomaly. Indeed, the recent updates to the household employment data showed that estimates of the number of unemployed are subject to large percentage revisions. 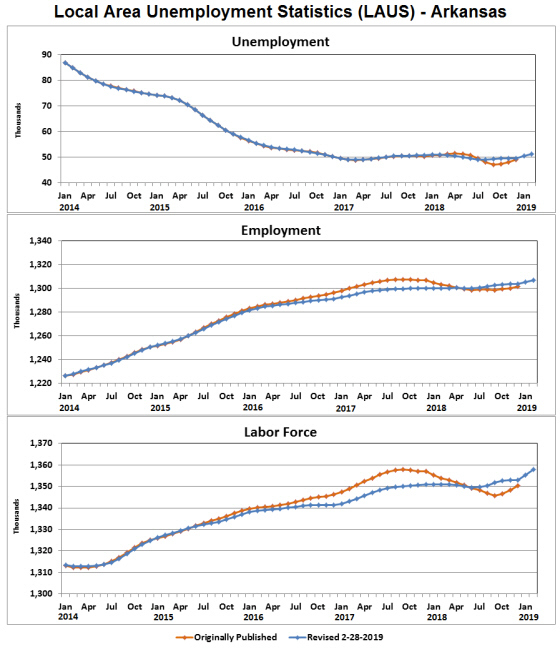 Nonfarm payroll employment statistics showed a net gain of 1,800 jobs in February, with the estimate for January revised up by another 800 jobs. From January to February, Manufacturing alone accounted for more than the month’s total net job gains. Retail Trade and Other Services also showed increases. Declining sectors included Construction and Education & Health Services. Manufacturing is also a standout sector in terms of job creation over the past year–particularly nondurables manufacturing. Total nonfarm payrolls are up 13.5% since February 2017, with nearly 40% of that increase attributable to manufacturing jobs. 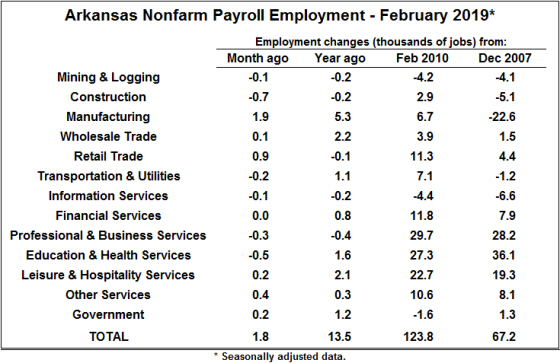 In percentage growth terms, manufacturing increased by 3.3%, compared to 1.1% growth in total nonfarm payroll employment. As illustrated in the figure below, much of the recent growth has been in durable-goods manufacturing. Employment in nondurables has been increasing since 2014, but the recovery of employment in durable-goods production is more recent. 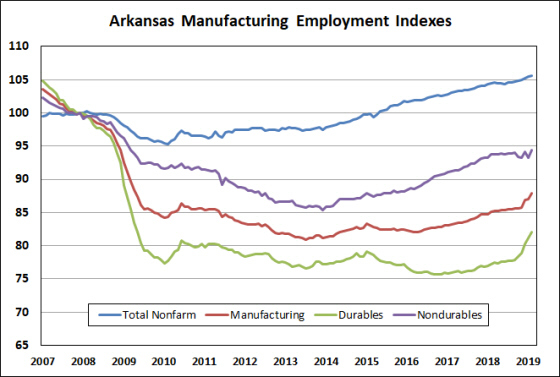 Over the past six months, in fact, employment in durables manufacturing has expanded at an annualized rate of 11.3%.